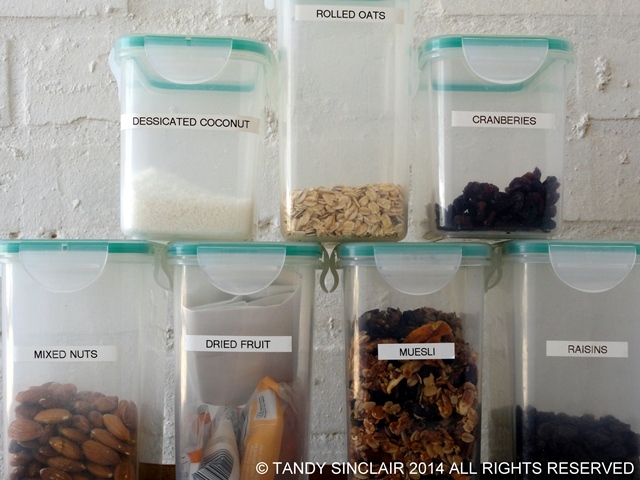 Stocking A Pantry With Container Items: There is no right way or wrong way to stock a pantry. This is just a post to share how I went about stocking my pantry. 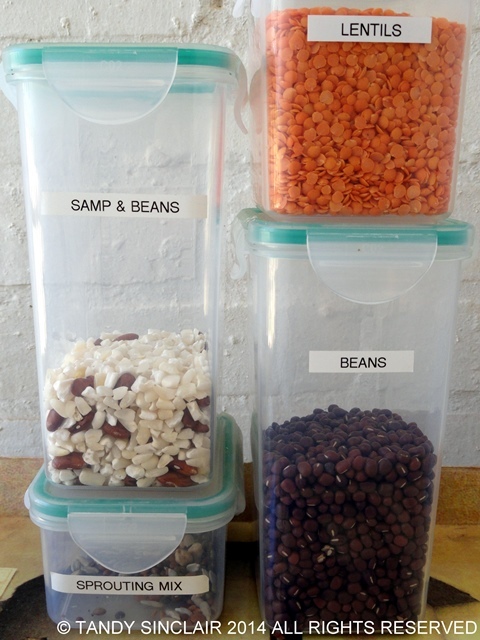 The items have grown over the years and as the pantry cupboard in my new kitchen is going to be quite narrow I have put all of my items into lock and go containers. These work really well. You can also see that I am a bit obsessed and everything in my kitchen is labelled! Flour is a basic ingredient needed in any pantry. You do not need to go overboard with a lot of different flours but I would recommend ordinary cake flour and self-raising for baking, bread flour for bread making and cornflour as a thickener. 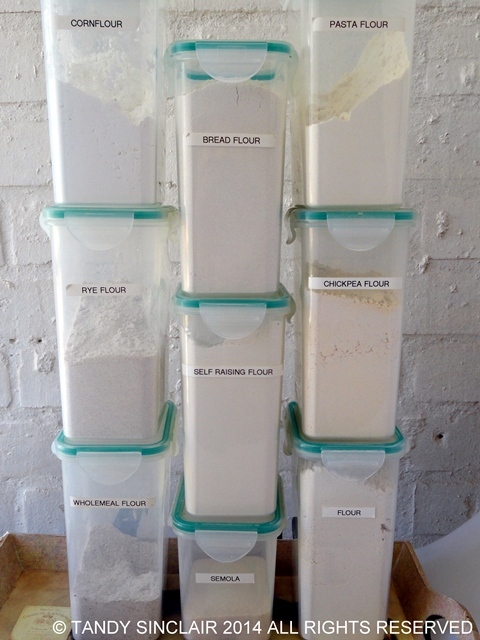 As you can see, I have 9 different types of flour! 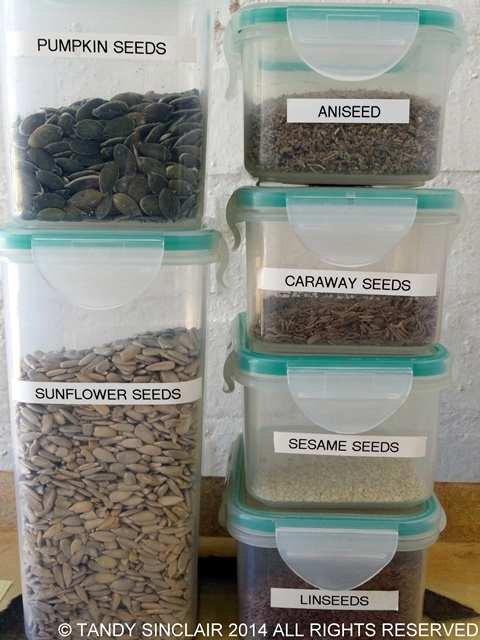 Next in my pantry is a collection of seeds. These are essential for the granola which I make every week. Pumpkin seeds are a worthwhile buy as they can be used toasted in soups, and for breads. Beans and lentils make up the next section. I also love to sprout my own sprouts and beans and lentils are a cost efficient way of bulking your meals. 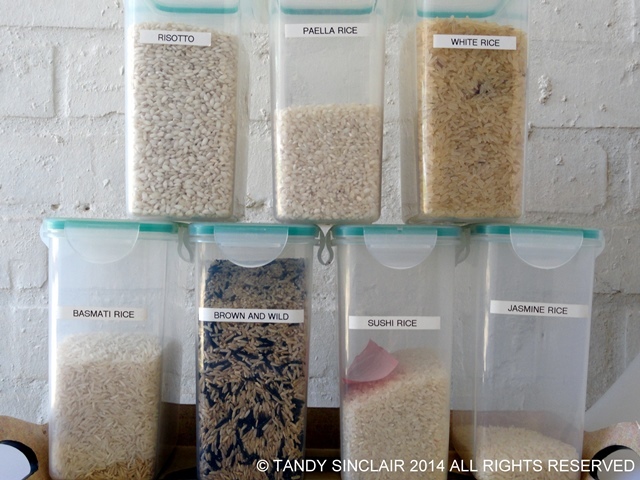 Rice is another house hold staple and you need to stock at least white rice and either jasmine or basmati rice for curries in my opinion. Personally, I prefer brown and wild rice for my casseroles. Sugar is next on the list. 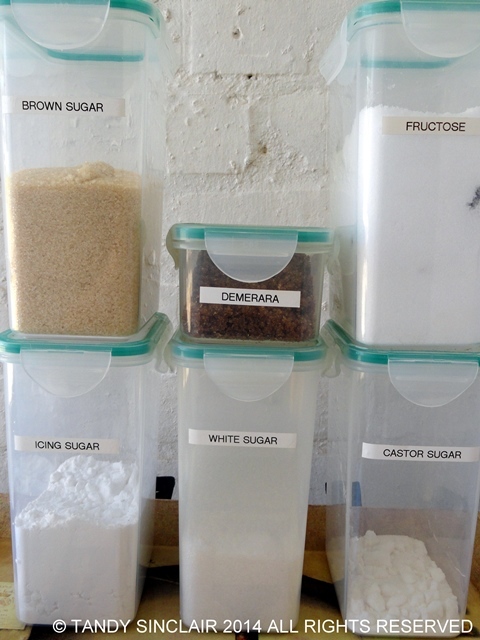 You will need granulated (white or brown) sugar and icing sugar at the very least in your pantry. As I do not use sugar I have fructose in my pantry. If you are going to replace sugar in your diet I would recommend you buy fructose over any other product. 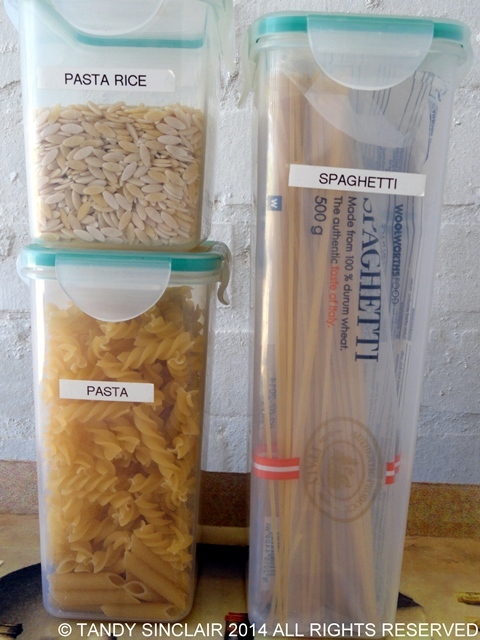 Pasta features heavily in my kitchen – the container marked spaghetti contains three different types of long pasta. I also always have a lot of pasta shapes and keep a few packets in the cupboard. Once opened I place the pasta into the container. These last a long time in my house as I prefer to make pasta from scratch when ever possible. For salad making and side dishes, we use quinoa the most often, and cous cous for variations. I also keep maize meal for pap as well as bulgar wheat for one of the bread recipes I use. My muesli container is for the little bit of granola I keep at home. Mixed nuts, dried fruit, rolled oats and dessicated coconut all go into making it. Rolled oats are a breakfast must! Dave makes them with a dash of whisky and cream or butter! Then I have my snack containers. I have recently added popcorn to this list which is a great snack in my opinion. The crumpet mix is for a quick afternoon treat and I have matza nearly every day with peanut butter and cheese. Dave and I have cheese on crackers every night after dinner. I will follow up this post with what I keep in my pantry cupboard in the near future. If you would like to show me what is in your pantry please link back to this post and I will create a link love list. I love the canisters. Where can I find them? Hehe!! My pantry is starting to look the same although my flour is kept in a 10kg tub and the sugar a 5 kg one 🙂 …and here I was thinking I had obsessive compulsive tendencies, you have made me feel very normal. Love the look of the bread too YUM! So neat and clean I can never hope to achieve a pantry as perfect as yours! Wow, no wonder you enjoy cooking so much! I think I’d be in the kitchen a lot more if we had more space and I had containers like that 🙂 Cooking in a clean and organised kitchen is a must!! This is a great story Tandy! I’m writing something similar but with different pantry items. I always put items in a container because otherwise you get those horrible pantry moths. Hi Tandy, gosh you are so organized, I certainly can use some tips from you, very impressive. The only semi-organised box I have is my cake decorating stuff in my Caboodle, which was my make-up case as a teen in the 90s… That was inspired by the Celebrity Bake Stars Event at Nitida – where they made baking seem so glamorous, I had to up my game. Wow, the container guy made a fortune at your house! I have similar items but lined up in an assortment of odd glass jars. 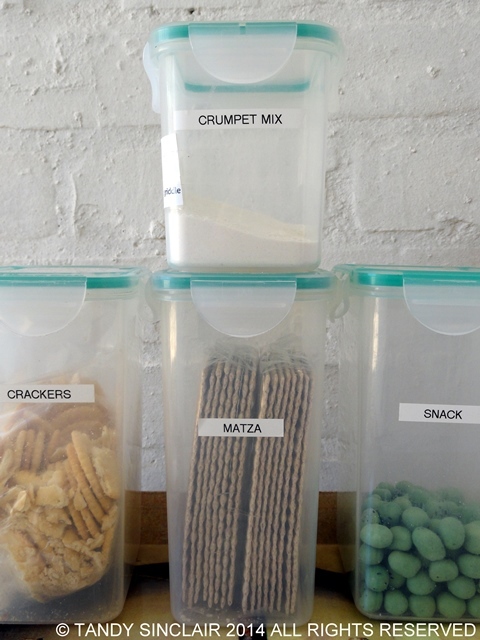 Wow – seriously organised! I need you to come round and sort out my larder! It would be my pleasure to do that! I love everything to match and be organised like you Tandy. I use Tupperware just because I have so much of it but unfortunately mine don’t all have the same coloured lids. I was just saying to my aunt and mom this weekend how I would love to change all the lids to white. Sadly not going to happen though. I love that all the containers match. And you have a ton of flour. Like wow. 😀 Can you do a fridge post too? I also have all my food stuffs in containers, the majority of mine are Tupperware which I have had for years as I have always been a Tupperware fan. 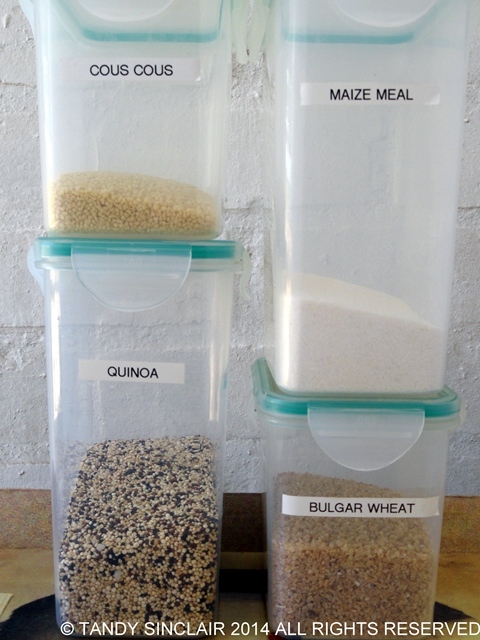 I also have a few of these type of containers as I like the square type they fit nicely in cupboards rather than round. Mine are also labeled, so you are not that obsessed, that is unless we both are.Ah Ah. Must be why we are such good friends! How did you do your labels ? Do you have one of those machines ? Amazing. I can’t believe your efficiency. It must certainly make life a lot easier.